Today was the fourth annual and largest day of action against cuts to refugee health -- organized by Canadian Doctors for Refugee Care and with support from other health providers, students and refugee advocates. In 2012, then immigration minister Jason Kenney announced drastic cuts to the Interim Federal Health Program, claiming it would save money and promote fairness. 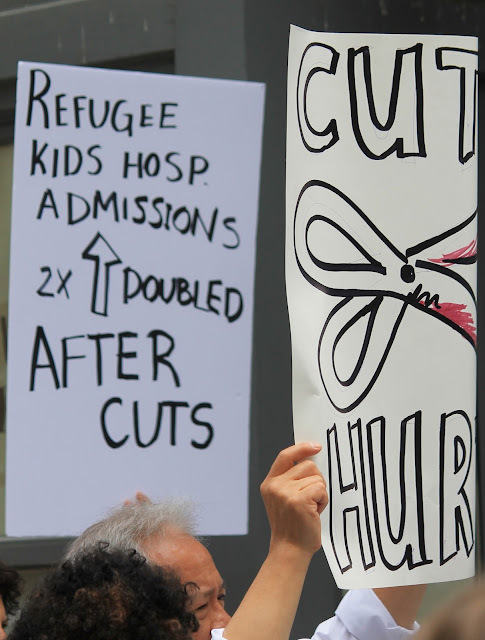 These cruel cuts targeted the most vulnerable people, and scapegoated them for the government's $36-billion cut to health care. As Dr. Mark Tyndall said at the time, "the government has used this issue to divide Canadians, pitting those who are dissatisfied with their own health coverage against refugees. Canadians are smarter than this. This is an attack on our entire health-care system." Following occupations of Conservative MP offices, and an open letter by leading health organizations, the first rally mobilized health providers -- doctors, nurses, midwives, and others -- in more than a dozen cities across the country. The government ignored this overwhelming medical advice and went ahead with their cruel and costly cuts, with predictable results. 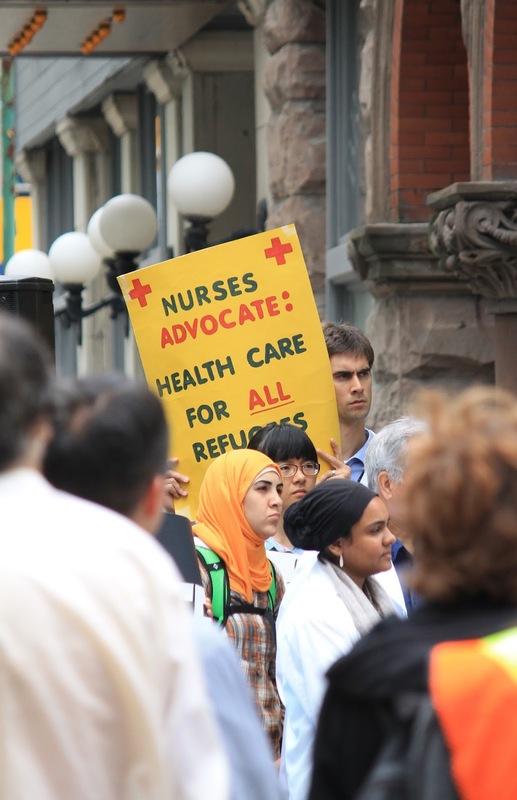 Following documented cases of refugees suffering from a denial of care, the second annual day of action in 2013 mobilized health providers in 19 cities across the country. The movement was growing both in numbers and in tactics -- with the Canadian Doctors for Refugee Care and Canadian Association of Refugee Lawyers launching a Charter challenge against the cuts, and prominent Canadians signing an open letter. While the government dismissed well-documented cases of refugees suffering from their cuts, the following year there was published evidence of the widespread impact of cuts. The study "The Cost and Impact of the Interim Federal Health Program Cuts on Child Refugees in Canada" found that the admission rate of refugee children doubled after the cuts -- proving that when you deny people primary care it makes them sicker and requires costlier hospital care. 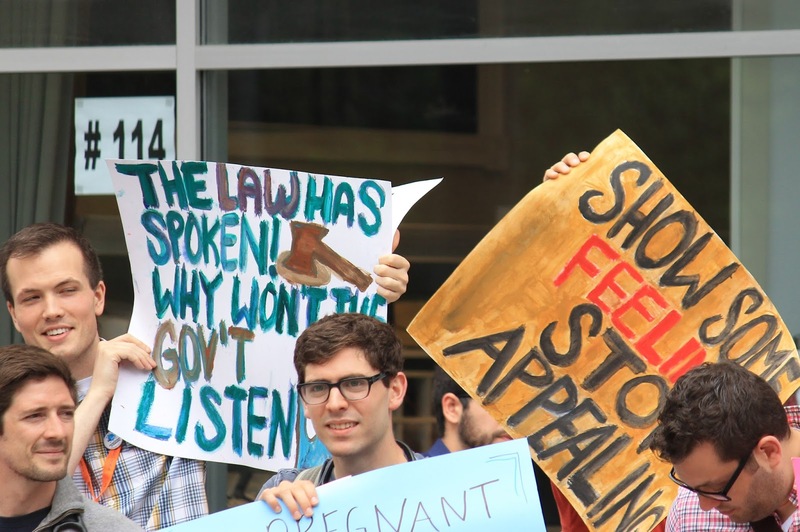 Health providers kept mobilizing, and in the wake of the third annual day of action in 2014 the Federal Court issued a scathing ruling against the cuts that reflected the growing opposition. Justice Mactavish found the cuts were "cruel and unusual": "The 2012 modifications to the [Interim Federal Health Program] potentially jeopardize the health, the safety and indeed the very lives, of these innocent and vulnerable children in a manner that shocks the conscience and outrages Canadian standards of decency ... I have found as a fact that lives are being put at risk." But rather than reverse their cruel and costly cuts, the Harper government has wasted over a million dollars to appeal the ruling -- debunking their own bogus claims about "cost savings." As Dr. Meb Rashid, medical director of the Crossroads Clinic at Women's College Hospital and Co-Chair of CDRC said, "Many Canadians will find it appalling to know the Conservative government is spending $1.4 million dollars in legal fees to deny health coverage to a vulnerable population rather than using that money in the most efficient and compassionate manner, which would be to simply provide important health services to refugees." 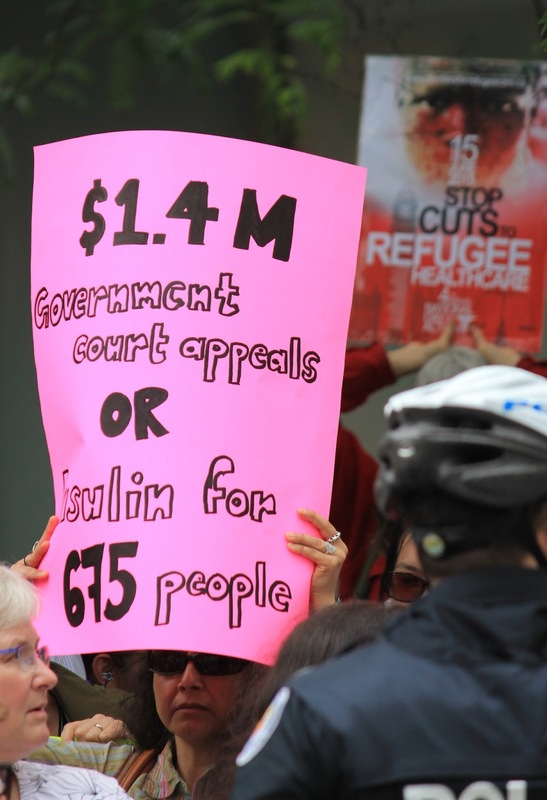 This year's rally took place in 20 cities across the country, a sign the government's bogus arguments are failing and solidarity with refugees is growing. As Dr. Tatiana Freire-Lizama, who came to Canada as a refugee, said to the Harper government at the Toronto rally, "if you think you can drive a wedge between refugees and the rest of the population, you are wrong. There is no 'us' and 'them.'" 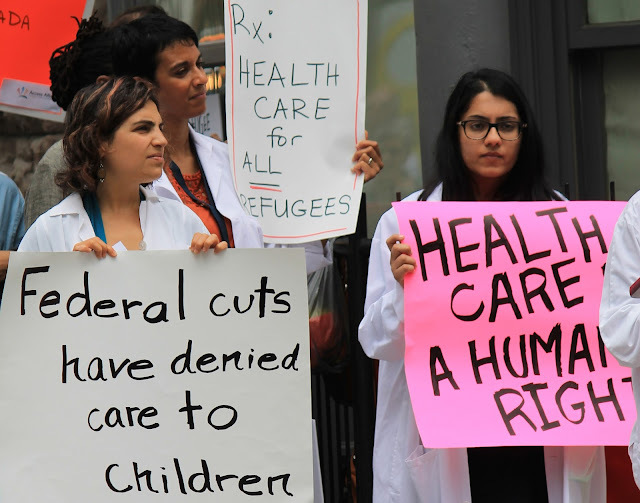 This solidarity will continue through mobilizing, legal battles, and the upcoming federal election -- to force whoever is elected to repeal the cuts to refugees and expand health care for all.